When someone suffers a slip and fall accident on someone else’s property, they often have the right to file a personal injury lawsuit against those who were responsible for the condition of the property. If the slip and fall injury occurs on government property, the rules can be a little different. The common law doctrine of sovereign immunity holds that governments cannot be sued without their permission. Both the United States government and the State of California have adopted statutes granting that permission, with certain limitations, to parties who hold personal injury claims against the government. Consulting with an experienced slip and fall attorney like Sean Salamati is crucial because failing to following the strict procedures will lead to a claim being dismissed. When is the government at fault for a personal injury? The government is not strictly liable – liable without having to prove negligence – for injuries on its property. Instead, a government entity can only be held liable if its employees did something negligent. In slip and fall cases, this might mean placing a hazard or failing to clean up a hazard. A park may appear to be public property but in actually be privately-owned by developers. In that case, a normal personal injury claim can be filed in court. A shopping area may appear to be private property but actually be a part of a public university campus or government hospital, requiring special claims procedures. Typically a homeowner or business is responsible for injuries caused by poorly-maintained sidewalks adjacent to its property. Some California cities have enacted a law shifting responsibility for sidewalks from private homeowners to municipalities so a personal injury claim may need to follow special steps. Speak with a lawyer to be sure a claim is followed according to the right procedure. California has adopted the Tort Claims Act, which grants permission to sue the state for civil liability claims for negligent acts of its employees. Falls on university property, in state government buildings, in state parks, and on other state government property must follow the procedures set forth in the Act. An injured party may file a claim against the state if one or more of its public employees would be liable for the injury based on an act or omission in the scope of duty. The employee-in-question’s act must have been required; there is no permission to sue if the injury was caused by the public employee’s discretionary act or omission. However, no suit may be brought against the employee personally. Within six months of the incident, a personal injury claim must be reported via an administrative claim, which must be made on a government-supplied form.. The State Board of Control must respond within 45 days and then the injury victim has six months from the response to file a lawsuit. There is no damages cap for injury claims against the state but but punitive damages are not permitted. Private parties have been permitted to sue the federal government for personal injuries since 1946, when Congress enacted the Federal Tort Claims Act (FTCA); until then, only specifically-authorized cases could be filed against the government. FTCA procedures must be followed in order to file a slip and fall claim arising from areas like federal parks, post offices, and other U.S. government buildings. Like the California Tort Claims Act, the FTCA permits personal injury claims against the government if the injury was caused by an allegedly negligent act of a federal employee. The employee’s action or inaction must have been within their scope of employment. If the negligence was on the part of an independent contractor rather than an employee, a lawsuit may be permitted in certain circumstances. The government can be held responsible for the contractor’s negligence if it treated the contractor like an employee – this generally means the government supervised the day-to-day activities of the contractor and had the right to control how his job was done. The first step in a FTCA claim is to file an administrative claim with the federal agency that you believe is at fault for the injury. The claim must be filed within two years of the date of injury and it must be detailed, outlining the evidence and the exact amount of damages claimed. The federal agency then has six months to respond and if it refuses to pay the claim, you have six months from the date of rejection to file a lawsuit in federal court. A claimant can only recover actual compensatory damages. The federal government will not be required to pay punitive damages or attorney fees under the FTCA. 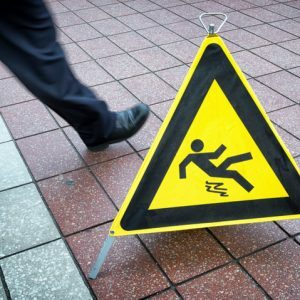 If you believe there is a chance your slip and fall injury may have occurred on government property and that the negligence or a defective condition may be the cause, do not delay speaking with an experienced premises liability lawyer. Failing to act in time and follow the required claim procedures could bar you from bringing a claim altogether. Los Angeles slip and fall lawyer Sean Salamati understands the process and is here to help you determine who is liable for your injuries. Call the Salamati Law Firm today at 1-888-259-4060 and take the first step to protecting your rights.